4 payments of $548.16 to be paid over the next 4 months (1 payment due each month) to pay the remaining balance. 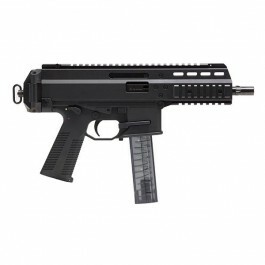 The B&T APC9 9mm semi-automatic pistol is the commercial variant of the highly acclaimed ACP submachinegun which is in use by elite military and law enforcement units around the globe. Made in Switzerland using state of the art materials and manufacturing methods, the APC9 semi-automatic pistol is a masterpiece of Swiss precision. B&T AG is a global industry leader in military and law enforcement weapon systems and accessories. Can I do a Form 1 AOW on a B &T APC 9 ??? An individual can't AOW on a Form 1, but a manufacturer can create an AOW on a Form 2 and then Form 4 it to the individual / Trust. Generally, it is cheaper to Form 1 a SBR to get your vertical grip than to hire a manufacturer to AOW the pistol and subsequently transfer. If you want to go that route, give us a call and we can get you some estimated costs.